In the late 80s, goth had become a bombastic beast that for better or worse was bent on imploding. It had grown from the small seedy clubs of London into the ugly stepchild the UK press tried to edit out of the family photos. No surprise then, that by the mid-90s, the giants were either in exile or splintered into inferior versions of themselves and the British press were given their moment to revel; goth was dead. Then someone had to go and spoil their party with a hit called “The Witch” and a bitter intensity combined with intelligence that made Porl King and Karl North’s Rosetta Stone impossible to ignore. 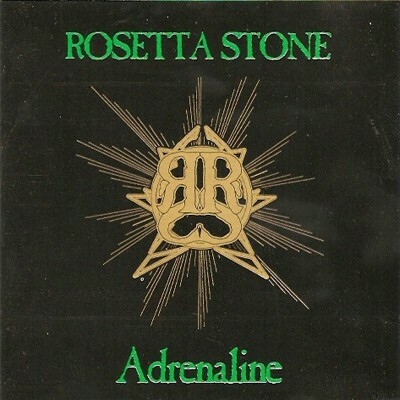 Adrenaline Deluxe finds the band mastering the sound the Sisters of Mercy set out to define with First and Last and Always but somewhat abandoned as the carousel of musicians defined the band as much as the music. Adrenaline was never really a proper album in the sense that, like The Cure’s Boys Don’t Cry, it is a compilation of tracks pulled from their debut An Eye for the Main Chance and subsequent singles, but it plays out like a near-masterpiece nonetheless. Massive and epic in every regard, these songs became the staple, the model for the prototypical goth-club album of the 90s. Sure, at this point they weren’t the first, last or always, but they were the absolute best. Not bad, considering it isn’t even close to being Rosetta Stone’s best material. This re-issue of the original American release also includes the Foundation Stones (early Sister-influenced-heavy demos and live tracks) and the Epitome EP, which includes remixes of “Adrenaline,” “The Witch” and their brilliant take on “Sisters are Doing it For Themselves.” One could contend a better packaging would have been to include tracks previously unissued in America (a handful from the original An Eye for the Main Chance album, recordings from their live album Under the Rose or the compilation of single tracks and remixes On the Side of Angels) and the brief liner notes misrepresent the band in almost every regard, but all in all, this is required listening for anyone who ever lined their eyes.